White Christmas tickets at Dominion Theatre, London. 2019-2020. 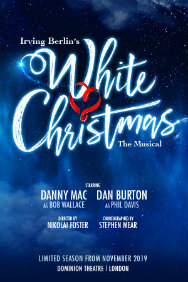 Find the best White Christmas musical tickets at Dominion Theatre, West End. Irving Berlin's White Christmas tells the story of two ex-army pals as they team up with a pair of sisters to put on a show to save their former General's remote Vermont ski lodge that's fallen on hard times. Performers Danny Mac (Bob Wallace), Dan Burton (Phil Davis). Music Irving Berlin. Lyrics Irving Berlin. Book by David Ives. Book by Paul Blake. Producer Jamie Wilson. Producer Mark Goucher. Producer Gavin Kalin. Producer Kevin McCollum. Director Nikolai Foster. Choreographer Stephen Mear. Design Michael Taylor. Costume Diego Pitarch. Music Stephen Brooker (musical supervision). Lighting Mark Henderson. Sound Tom Marshall. Music Larry Blank (orchestration). Music Jason Carr (musical arrangement). Friday, 15th November 2019 to Saturday, 4th January 2020. Open 25th Nov 19. White Christmas tickets: The tabs above allow you to select between links to suppliers and date searching. Click on a supplier's logo to see their details and on the 'buy now' button to see and check the tickets on offer.